Standing to Sue for a Pharmaceutical Injury | Hupy and Abraham, S.C.
Do I have the right to file a pharmaceutical injury case or to join a pharmaceutical class action lawsuit? You were hurt by the medication or medical device. You are the legal guardian of someone who was hurt by the medication or medical device. You are the representative of the estate of someone who has died because of a defective medication or medical device. If one of these three things is true, then you may have standing to bring a case for damages against a pharmaceutical company if you can reasonably prove that the pharmaceutical company was negligent in the design, manufacturing, or marketing of the product that hurt you. What If You Used the Drug for an Off-Label Use? 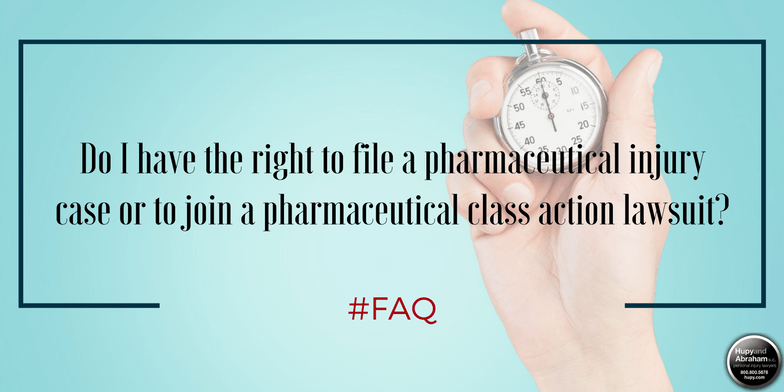 You may be able to join a pharmaceutical class action case even if you took a drug that was approved by the Federal Drug Administration (FDA) for some uses, but not for the condition for which you took the medication. Doctors often prescribe FDA-approved drugs for other conditions that are not included on the label, and pharmaceutical companies sometimes market their medications to doctors for these off-label uses. You are one of a class of people who suffered similar injuries from using the drug for the same off-label purpose. You may not know if there is a class of people until you begin to research your legal options. The pharmaceutical company marketed the drug for an off-label use or knew that it was being used for off-label purposes and failed to try to stop it. If the pharmaceutical company was trying to profit from the off-label use, or knew or should have known that it was going on, then it could be liable for any harm that was caused by the medication. The first step in determining standing is to consult with an experienced pharmaceutical class action lawyer who has done this before and who knows how a pharmaceutical class action case works. For more information, please start a live chat with us now or call us at 1-800-800-5678.